In honored remembrance of Lieutenant Fulco, whose tragic loss symbolizes the dangers that the young men and women of the American military face each and every day in our behalf. Friends, family, fellow pilots and students on Monday will honor a career Navy pilot known as a great teacher and motivator, who died in a plane crash on Wednesday. The Navy confirmed Friday that a body found Thursday near the site where a T-45 Goshawk crashed in the Atlantic Ocean about 93 miles off the coast of Jacksonville, Florida, was that of Navy Lieutenant Gregory Fulco, the training jet's pilot. "(He was) very energetic, very upbeat, always had a smile on his face," said Commander Jay Chesnut, commanding officer of VT-22, the training squadron at Naval Air Station Kingsville to which Fulco, whose nickname was Joey, was assigned. Fulco, who joined the squadron in December 1999, was a T-45 instructor pilot and a landing signal officer, a position in which he monitored and graded approaches and landings during students' carrier qualifications. "He's a very motivational (Landing Signal Officer) . . . a rising star in the squadron. The guy was a phenomenal officer." Chesnut described Fulco, who lived in Corpus Christi with his wife, Lorian Fulco, as a vocal, but kind person who had good rapport with his students and loved carrier aviation. "He's the kind of guy who would give a briefing like a half-time football speech," he said. "He was always the kind of guy who could give and take jokes." Chesnut said Fulco's talent as an instructor was evident in the pilots he trained who graduated in January 2000. Usually one or two students out of a group of six don't qualify, but all of Fulco's did. Fulco, 30, and Air Force Captain Justin Sanders, 26, were killed after ejecting from the jet shortly before it crashed Wednesday afternoon. Sanders' body was recovered shortly after the crash. At the time of the crash, Fulco and Sanders, who was on the flight as a backseat observer, were circling above the aircraft carrier USS Eisenhower, performing safety observation duties while training jets performed take-offs and landings on the carrier. No reason has been given for the crash, which remains under investigation, said Master Chief Jim Rostohar, public affairs officer at Naval Air Station Kingsville. "It is a very sobering thought, it could have happened to any of us," Chesnut said. "We constantly train to minimize these risks. We try to manage the risk because we know it's there." The memorial service for Fulco will be at 10:30 a.m. Monday at Naval Air Station Corpus Christi and will include comments from commanding officers, a scripture reading, a rifle volley, "Taps" and an overhead salute to Fulco by aircraft in the missing man formation. "This brings closure to the issue for us," Chesnut said. "It's a chance for us to be together, to grieve, remember and celebrate his life." Memorial services for Sanders will be at 3 p.m. today at Vance Air Force Base, according to the public affairs office at the Air Force base. Lieutenant Fulco was laid to rest on 9 March 2001 in Arlington National Cemetery with full military honors (Section 66 Grave 6324). A Navy T-45 Goshawk training aircraft crashed February 21, 2001, into the Atlantic Ocean off the coast of Florida killing Air Force Captain Justin Sanders and Navy Lieutenant Gregory Fulco. RANDOLPH AIR FORCE BASE, Texas (AFPN) -- A T-45 Goshawk training aircraft crashed, February 21, 2991, into the Atlantic Ocean off the coast of Florida killing two pilots, one Air Force and the other Navy. The body of Captain Justin Sanders of the 33rd Training Squadron at Vance Air Force Base, Oklahoma, was recovered, and Navy Lieutenant. Gregory Fulco, a VT-22 instructor pilot at Naval Air Station Kingsville, Texas, was presumed dead when the search was called off because of darkness. The crash occurred approximately 81 nautical miles from Mayport, Florida. Sanders and Fulco were performing safety observer duties about one nautical mile from the aircraft carrier USS Eisenhower (CVN-69). The aircraft was temporarily assigned to a detachment based at NAS Jacksonville, Florida, where aircrews were performing aircraft carrier landing qualifications. The T-45A is a two place, high performance, fully carrier capable, training aircraft. It provides the Navy the capability to train student naval aviators for high performance jet aircraft and initial carrier qualification. RANDOLPH AIR FORCE BASE, Texas (AETCNS) – At approximately 4:18 p.m. EST February 21, a T-45 Goshawk training aircraft crashed into the Atlantic Ocean off the coast of Florida killing two pilots, one Air Force and the other Navy. The body of Air Force Captain Justin Sanders of the 33rd Training Squadron at Vance Air Force Base, Oklahoma, was recovered. Navy Lieutenant Gregory Fulco, a VT-22 instructor pilot at Naval Air Station Kingsville, Texas, was presumed dead when the search was called off because of darkness. The crash occurred approximately 81 nautical miles from Mayport, Florida. Captain Sanders and Lieutenant Fulco were performing safety observer duties about one nautical mile from the aircraft carrier USS Eisenhower (CVN-69). The Navy has begun an accident investigation to determine the cause of the mishap. The aircraft was temporarily assigned to a detachment based at Naval Air Station Jacksonville, Florida, where aircrews were performing aircraft carrier landing qualifications. MAYPORT, FLORIDA - Investigators want to know what caused a trainer jet to crash and kill two pilots. It went down in the Atlantic Wednesday night. Searchers pulled one body from the water and the other pilot is presumed dead. The missing pilot has been identified as Gregory Fulco. The body of the backseat pilot, Air Force Captain Justin Sanders, was positively identified. Their T-45a Goshawk crashed just a mile from the USS Eisenhower while its pilot practiced aircraft carrier takeoff and landings. The T-45a was based at Kingsville, Texas and had been temporarily assigned here in Jacksonville. Two pilots, a Navy instructor pilot and an Air Force test pilot, were killed when their T-45A Goshawk crashed into the Atlantic while observing student pilots practice carrier landings and takeoffs from the USS Eisenhower (CVN-69). Although both ejected from the aircraft, they did not survive. About 5:30PM on Wednesday, a T-45A Goshawk trainer, headed toward the carrier USS Eisenhower (CVN 69) from Jacksonville (FL), went into the drink, killing both Navy Lieutenant Gregory Fulco, 30, an instructor pilot based in Kingsville (TX), and Air Force Captain Justin Sanders, a test pilot based at Vance Air Force Base in Enid (OK). Fulco's regular duty as a safety observer was to circle above the carrier, making notes on student pilots' landings and recoveries. The cause of the accident, and any further details, are being withheld, or are not known, at this time. MAYPORT, FLORIDA - The Navy says it has recovered the body of one of the two men who's jet crashed into the Atlantic ocean. The missing pilot has been identified as Gregory Fulco. The body of backseat pilot, Air Force Captain Justin Sanders, was positively identified today. The pilots were on a training mission one hundred miles off the coast of Jacksonville yesterday afternoon when their T-45a Goshawk crashed. A T-45 Goss Hawk jet, based out of Texas, was on a training mission about a hundred miles off Mayport around 5:30 last night. The jet crashed as it was doing training exercises near the aircraft carrier, U.S.S. Eisenhower. The public information officer out of Texas says witnesses reporter seeing parachutes after the crash. However, the search was called off due to darkness so there is no confirmation if the bodies were recovered. They were doing touch and go training exercises in the T-45 Goss Hawk - a training aircraft used to teach pilots how to take off and land on a carrier. They were a mile from the carrier when they crashed. There is no word if the aircraft was taking off or returning to the carrier. The T-45 squadron is based out of Kingsville, Texas. As one of the last stages of getting wings as a naval aviator, pilots must make several carrier landings, called "traps and launches". Normally, about 25 students and instructors come to Jacksonville or another base to work with ships in the area. The body of Air Force Captain Justin Sanders, who was in the backseat of the plane as an observer, was recovered shortly after the crash, the Navy said. Navy Lieutenant Gregory Fulco, 30, the plane's pilot and an instructor pilot at NAS Kingsville, was missing and presumed dead, Navy officials said. The search for the instructor pilot assigned to VT-22 training squadron was called off because of darkness, said Master Chief Jim Rostohar, public affairs officer at NAS Kingsville. He did not know if the search would continue today. "Normally they don't do that, but I'm not sure," he said. 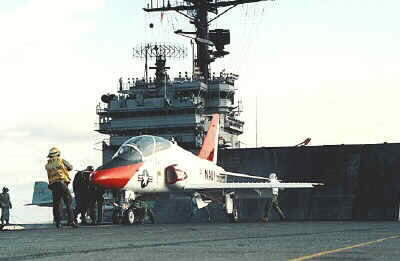 At the time of the crash the T-45A Goshawk was circling the aircraft carrier observing student pilots practice take-offs and landings, a standard safety maneuver, Rostohar said. Fulco and Sanders ejected from the plane just before it crashed into the Atlantic Ocean more than a mile from the aircraft carrier, the Navy said. Sanders, a test pilot, was an Air Force observer from the 33rd training squadron at Vance Air Force Base in Enid, Oklahoma. Fulco was originally from Metairie, Louisiana. He was married, Rostohar said. August 19, 1998 - A Marine Corps student pilot died trying to land a T-45 training jet on the USS John F. Kennedy about 70 miles off the coast of Jacksonville. April 15, 1997 - A student pilot on her first solo flight ejected safely from a T-45 that crashed in a pasture south of the base. The Navy ruled that the crash was caused when a turkey buzzard flew into the jet's engine. November 1, 1996 - An instructor and student pilot ejected from a T-45 seconds before it crashed. The Navy ruled the crash was caused by a duck that flew into the jet's engine, stalling it. March 17, 1996 - A pilot from NAS Kingsville ejected from his plane during an emergency landing at Naval Air Station Cecil Field in Jacksonville. 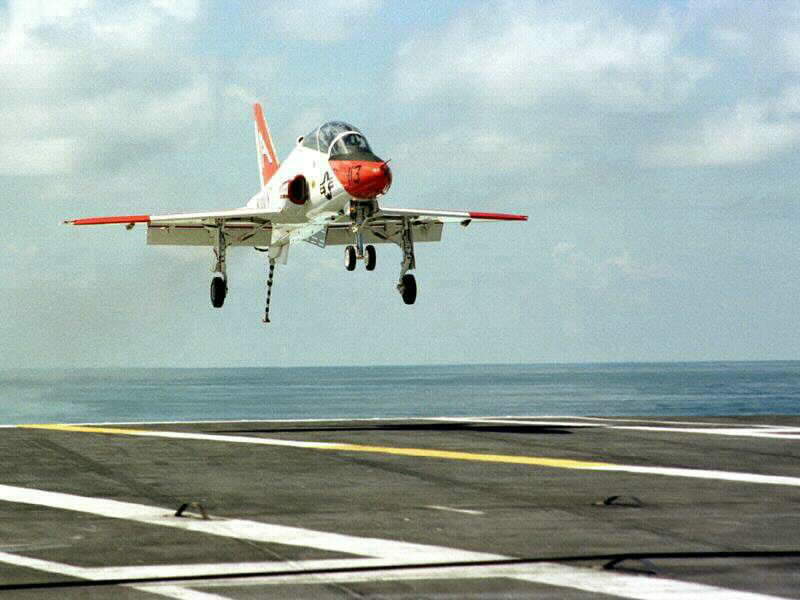 The pilot, who was not injured, notified officials that two tires on his T-45 had blown out during takeoff from the aircraft carrier, USS John F. Kennedy. He had planned to land the aircraft without the wheels, but ejected after it first made contact with the runway, officials said. Navy Lieutenant Gregory Fulco of Corpus Christi should have been on his way home today; instead, the Navy called off the search for his body at about 2 p.m. Thursday. The instructor pilot at Naval Air Station Kingsville has been missing since he ejected from a T-45 Goshawk before it crashed into the Atlantic Ocean at about 3 p.m. Wednesday. Navy officials said Fulco is presumed dead. Air Force Captain Justin Sanders, a passenger in Fulco's plane, also ejected and his body was found shortly after the crash. NAS Kingsville plans to have a memorial for Fulco. Officials today are expected to announce a date for the service. Fulco, 30, originally from Metairie, Louisiana, lived in Corpus Christi with his wife Lorian Fulco. Navy officials said the couple's parents were in Corpus Christi with her Thursday evening. The training jet from NAS Kingsville crashed into the Atlantic Ocean 93 miles off the coast of Jacksonville, Florida, as it circled the USS Eisenhower to observe as student pilots practiced taking off and landing on the aircraft carrier. The observation they were conducting is a standard safety maneuver. The cause of the crash remains undetermined and Master Chief Jim Rostohar, public affairs officer at NAS Kingsville, said it might be months before the cause is known. "It's a meticulous process," he said. "It could take as long as several months. But they will determine the cause of the accident." Sanders, 26, a T-37 instructor pilot with the 33rd Flying Training Squadron at Vance Air Force Base in Enid, Oklahoma, was on the jet with Fulco as a backseat observer, Navy officials said. Rostohar said this is a routine practice where members of one military branch observe how members of another branch work. "It's a good way to learn different systems and different aircraft," he said. Training on the aircraft carrier is one of the last lessons in strike pilot training. NAS Kingsville sends about 25 student pilots to Jacksonville every six to eight weeks, Rostohar said. As an instructor, Fulco was on a rotation that sent him to Jacksonville about twice a year. The trip Fulco was on was to last four to five days. Wednesday was the fourth day and Fulco probably would have returned to NAS Kingsville on Friday, Rostohar said. Vance Air Force Base canceled flights Thursday in honor of Sanders, who was a native of Tulsa, Oklahoma. At NAS Kingsville and on the USS Eisenhower flags were lowered, but training continued Thursday afternoon, Rostohar said. "We still have a mission to do," Rostohar said. "We still have to train pilots. We'll investigate this fully, but we cannot stop our mission." But as the training continued, Fulco and his family were on the minds of many. "People in the squadron will do whatever it takes to help the widow with everything," Fulco Winn said. "It's an extended family. They're the people you hang out with on the weekends and spend the holidays with." And the risks associated with being a pilot are part of the bond pilots and spouses share. "I have to understand that it's what he loves," Fulco Winn said. "I have to hope and pray that everything turns out all right."